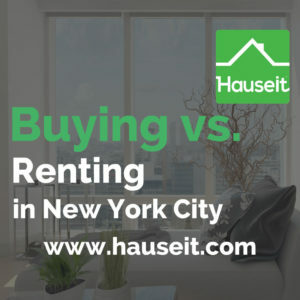 Buying vs Renting in NYC - Pros and Cons | Should You Rent or Buy? Should you rent or buy in NYC? Is it true that renting is cheaper than buying in NYC? How much are buyer closing costs in NYC? In this article, we comprehensively explain the pros and cons of buying vs. renting in NYC. Owning real estate in NYC is the easiest and most passive way to build your net worth over time. While it’s true that a monthly rent payment in NYC is often lower than a mortgage payment for the same apartment, this simplistic cash flow analysis ignores the fact that buying allows you to borrow a huge amount of money at a low interest rate for decades. Even if annual stock market returns are higher than those for real estate in NYC, you would not be able to borrow enough money to invest in stocks compared to the size of the mortgage you could receive in NYC. For example, investing $200k of savings in the stock market may give you 6% per year on $200k. If you used $200k as a down payment on a $1,000,000 apartment in Manhattan, you’d have the potential to earn 4-6% on $1,000,000 (not just on $200,000). As a result, the upside for your net worth is far higher with real estate. A mortgage is one of the only opportunities you’ll ever have to borrow a large amount of money which is not ‘marked to market’ against the value of your apartment. If you borrowed money against stocks or other assets, you’d have to pay back some or all of the loan immediately if the value of your assets ever temporarily fell below certain thresholds. Being forced to sell an investment at the temporary market low to pay down a loan is a nightmare, and this is one of the main reasons why financial investors using leverage often get ‘wiped out’. A mortgage is not ‘marked to market,’ which means that you’ll never have to pay the back early even if the value of your apartment temporarily decreases for a few years. Buying an apartment in NYC with only 20% down would give you 100% long term upside on the full purchase price without any risk of your financing (i.e. leverage) being pulled from under you. As long as you keep paying your mortgage payment, your financing is guaranteed to remain in place. Buyer closing costs in NYC are high, but so are rental broker fees. Is it really a good idea to pay a 15% broker fee every year or two when you rent a new apartment because you feel that buyer closing costs are too high? Furthermore, are high buyer closing costs a valid excuse to say no to 4-6% annual long-term upside on a $1,000,000 condo in Lower Manhattan? While buyer closing costs in NYC are between 1.5% to 5% of the purchase price, you only pay them one time compared to a 15% rental broker fee which you have to pay every year or two. Furthermore, any cash flow savings you achieve by renting vs. buying are a rounding error compared to the upside you could have by borrowing 80% on a $1-2m condo in NYC and reaping a 4-6% annual return on your real estate investment. 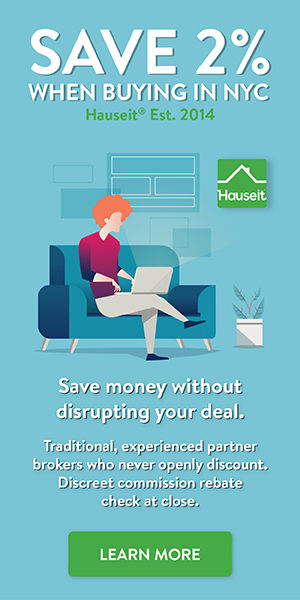 Furthermore, you can actually reduce your buyer closing costs by requesting a Hauseit Buyer Rebate on your purchase. Requesting a Hauseit Buyer Rebate is a legal and non-taxable way to extract some of the built-in sale commission which the seller has already agreed to pay. You can learn more about Hauseit Buyer Rebates here. Profits are made in real estate when you buy, not when you sell. In NYC, not all apartments are equally good investments. Buying instead of renting only makes sense if the apartment you decide to buy has attractive fundamentals. As a buyer, you should pay close attention to price per square foot, carrying costs as well as the cost of anticipated future apartment and building repairs. The length of your hold period also impacts how you analyze each of these items. Overpaying for an apartment is the easiest way to ensure that you will make no money or even lose money when it comes time to sell. However, ‘overpaying’ doesn’t imply that engaging in a bidding war is a bad idea. There are many apartments which attract bidding wars that have solid fundamentals and long-term upside. This is in partly the reason why these listings are prone to receiving multiple offers. As of 2018, the Lower East Side (LES) is one of Manhattan’s most promising neighborhoods with arguably the most PPSF (Price Per Square Foot) upside out of any neighborhood in Manhattan (alongside Two Bridges, the adjacent neighborhood to the South). When considering long term upside, the natural comparison to make would be to look at the asking PPSFs in the West Village. The West Village is in a more advanced stage of gentrification, so it’s conceivable that prices in the Lower East Side will eventually reach West Village current levels. Over time, the idea is that the annual growth rate of prices in the Lower East Side will exceed those in the West Village until a smaller and more reasonable pricing basis exists between the two neighborhoods. If you buy a condo in LES for $2,100 PPSF today and condos in the West Village are selling for under $2,000 PPSF, it means that you’ve overpaid. Buying the LES condo for $2,100 PPSF will obviously not offer you the same potential for upside as the more reasonably priced condo in LES asking $1,500 PPSF, regardless of how fancy and luxurious the ‘new construction’ building actually is. On the other hand, if you are buying as a primary residence and luxury is a requirement then the $2,100 PPSF new construction condo is the best option for you! Apartment carrying costs, like all other expenses, do one thing over time: go up. Buying a condo that has above average common charges (or a co-op with unusually high monthly maintenance charges) is generally a bad idea unless you are paying much less for the apartment to compensate for the high monthlies. When looking for apartments, it’s a good idea to have your buyer’s agent investigate the 5 year history of monthly maintenance increases for the building. If the building has a history of large and consistent annual increases, it suggests that the building either has an unsustainable cost structure or the building is poorly managed. One key benefit of renting is that you are typically not responsible for the cost of building and apartment repairs. However, the amount of rent charged by your landlord is partly determined by the landlord’s long-term cost of ownership, which include the cost of anticipated repairs and upgrades. When buying an apartment in NYC, it’s always a good idea to have your buyer’s broker find out when the building’s costliest components were most recently repaired or replaced. The most expensive repair bills for apartment buildings in NYC typically relate to elevators, boilers and heating systems, façade work and the roof. Buying into a building which has recently upgrade some or all of these components will help minimize the risk of you receiving a special assessment bill. If you anticipate moving for work every few years, then renting in NYC is a better financial decision than buying. The reason for this is that the high buyer and seller closing costs in NYC will take a bite out of your net worth every time you buy and sell. If you are likely to move, buying only makes sense if you can still afford to hold onto your NYC apartment as an investment property once you’ve relocated. If you anticipate moving but holding onto your NYC apartment and renting it out, then you should consider buying a condo as opposed to a co-op apartment. Co-op apartments are less expensive than condos, however they are primarily designed for owner-occupancy and most co-ops have subletting restrictions. Pro Tip: Confused about condos and co-op apartments in NYC? Read our comprehensive Condo vs. Co-op Comparison for NYC. Buying an apartment in NYC requires a long-term mindset, both emotionally and financially. This is because home ownership in NYC, despite the wealth it will generate for you, can come with unanticipated expenses as well as other headaches from time to time. Let’s say you close on a $700k condo in Park Slope, only to receive a special assessment bill a week later from your condo board for roof repairs in the amount of $10,000. Assuming you did everything you could to detect potential future building repair expenses before buying, this bill should have zero impact on your financial well-being or mental stability. In other words, you need to have a financial position and resilient mindset which would not be affected by this bad news because you are confident that the apartment will increase in value consistently over time. Here’s another example: you complete a $70,000 renovation of your new apartment only to be told by the condo board that you bought windows that aren’t permitted by the condo board and that they need to be replaced at the cost of $15,000. Being a homeowner in an apartment building in NYC means that you have to deal with neighbors, some of which are nosy, rude or seemingly on a mission to cost you time, emotion and money. While you should always advocate for your self-interest and defend against injustices, being a statesperson is a requirement for owning an apartment in NYC.